Few members of the GRYC can remember when the islands were not home port to the Club. Fewer still will remember when the islands were not islands at all but part of the west shoreline. The Chelsea reservoir was formed by the construction of the Hydro dam at Chelsea in 1925-26. The flooding widened the river covered some sections of the mainland and turned others into islands. The existing railway and highway were covered. The railway actually ran under the catwalk and in the gap between the mainland and the little island at the entrance to the south bay. The original highway is the gravel road that leads down to the catwalk. In the 1950s, against my friends' well-intentioned advice about logs, I decided to buy a sailboat. Upon a tip I made a bid on a Rhoades Bantam which was the class boat of the Civil Servant's Recreation Association. My bid was successful and I became the proud possessor of my first craft. My sailor friend, John Campbell, undertook to show me the rudiments of the sport. I was thrilled to be on the river, being moved up and downstream, at no expense to me, by the friendly- and sometimes not so friendly- winds which have a habit of bouncing off hills and trees, making at times the challenge of finding a true wind a challenge indeed. It has been said that if one can sail the Gatineau one can sail anywhere. Willy-nilly I became a sailor-of sorts. Soon John Campbell and his family moved to the Gatineau and joined me with his boat on the river. We began to do a spot of racing - down from Larrimac, once round the islands, then down to the Tenaga log boom and home. From time to time we invited others whom we met sailing to join the fun. By 1959 we thought we had something going and as a rather brash suggestion from me, still a neophyte sailor, I asked - how about forming a sailing club? Several impromptu meetings were held on cottage verandas to discuss the formation of a boat club, enthusiasm waxed and waned. This sort of thing persisted until 1962 when our hands were forced. This is how it happened. From where our gate stands now once ran a squared log boom, the only access to the cottages to the north on the west shore. All groceries and supplies had to be carried the length of the boom. Several of us had made a somewhat informal arrangement to make fast our boats., three or four of them to the boom. Regrettably some of us were not too seaman-like in this operation, with the result that some near-accidents took place as cottagers made their way along the floating pathway. In late August it was gently suggested that the sailors might make alternative arrangements in 1963. We readily agreed to this affable request and as a result, five of us met on September 2nd in the living room of Ivan Herbert to discuss our problem. To my delight, the others (Al Richens, Gerry Byers, John Winfield, and Ivan) generally agreed that a boat club just might be the answer. One of our number was aware that the Canadian Pacific Railway was replacing the timbers of the railway bridge at Ironside. A phone message or two later and we found ourselves in possession of the discarded squared timber provided we carted it away. Within two weeks our small organisation was increased by three new members and we went into the timber trucking business, piling them neatly at the bottom of the hill. Six weeks later the number of members had grown to 24. All that winter we met, discussing this and deciding that. Ivan became President of the Gatineau Boat Club, I myself was Secretary, Alex Wylie was Treasurer, and Gerry Byers, Harbour Master. By Spring we had grown to 90 members. 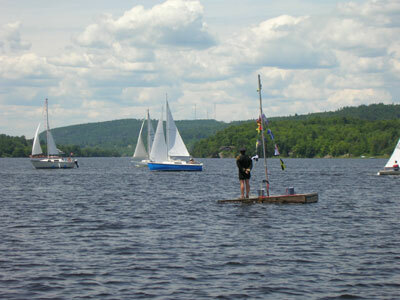 The Club had become the Gatineau River Boat Club (later to be changed to its present name -Yacht Club - at the instigation of the Canadian Yachting Association) What activity there was to make ready the cottage and to launch our garnered squared timbers as a floating jetty, at right angles to the hill. It was not all work however, as we managed to run two regattas along with a series of races for members. The juniors were not forgotten, being taught to sail, swim and canoe. They even held their own regatta. A program of social and fund-raising events rounded out the season of 1963. By the time of the 1963 General Meeting our membership had grown to an astonishing 181. The annual dues were $15 per family or $10.00 for a singleton - and no initiation fee. The general meeting was a crucial one to the fledgling club. The main topic of discussion did not even appear on the agenda, having erupted that very afternoon. Frank McIntyre, the real estate agent, had phoned me, as the Club's Secretary, to say that the islands were to be placed on the market - and would the Club be interested? Obviously the question was being posed at a most opportune moment, but the time between the call and the meeting did not permit me to advise either the Commodore or Vice-Commodore so the announcement came as a bombshell to all present. That winter was not a restful one for the members of the Board. How does an organisation with such low dues and absolutely no collateral purchase a couple of islands and a summer cottage for a sum even as small as $10,000 - $15,000. The Board met eight times during the winter and there were dozens of phone calls and face-to-face meetings in twos and threes. Suggestions for financing were discussed, amended, abandoned and revisited time and again. After much head-scratching (and the inevitable anxiety that someone else might beat the Club to it) a scheme whereby the membership would be asked to each put up a $100.00 loan was adopted. The plan was presented to the membership at a general meeting on April 8, 1964 at which time the Board was authorised to make an offer of purchase for the property. On April 8th 1964, the Club offer was accepted and the islands were ours!!! May 1st was the red-letter day when the GRYC took possession.